The more you get into car modification – and so the more that you explore the technology – the greater the realisation that the facilities and tools you can bring to the process are severely limited. No, not tools like spanners and socket sets, but the tools that real designers of cars apply to their trade. So, um, yeah, that’s a nice list – but so what? Well, you can use DIY techniques that accurately and easily replicate the functions of all this normally ultra-expensive test gear! All you’ll need is a road, your vehicle, some ingenuity and (often) the services of a helper. Whether you’re building a vehicle from scratch, working on a diesel or petrol or electric car, or you’re modifying a mega-dollar car or one bought for just a few hundred bucks, these techniques are all applicable. They’re tools I have used over 20 years of modifying cars, and they’ve have stayed just as relevant as my interests over that time have moved from a Holden VL Commodore Turbo, to a Daihatsu Mira Turbo, to a Subaru Liberty RS, to an Audi S4, to a Lexus LS400 V8, to a Toyota Prius, Peugeot 405 diesel, Honda Insight - and a human-powered recumbent trike! So let’s examine them, and also take a look at real-world examples of their use. We’ll start this week with intake and exhaust flow testing. All combustion engines require the flow of gas. 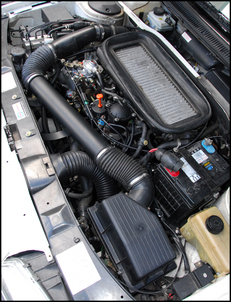 In a petrol or diesel engine, the flow of intake gas (air) starts at the intake to the airbox. 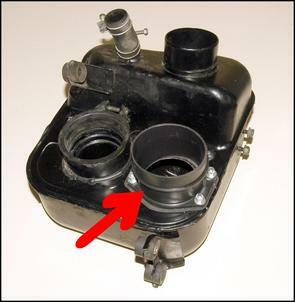 The air flows into the airbox, passes through the filter, exits the airbox and then often passes through an airflow meter. In some cars it then moves straight onto the intake manifold; in others it passes through a throttle butterfly. There might also be one or more turbo compressors ahead of the engine. If at any point in this process there are restrictions, the pressure of the air will decrease. Therefore, by measuring pressure drops through the intake system, you can quickly identify where the restrictions are. Clearly, the process will work best if the airflow is at the same levels that occur in the engine when it is operating; therefore, the technique is most accurate if it is undertaken when the car is being driven on the road. 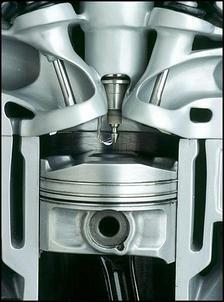 On the exhaust side, the exhaust gases are forced out of the engine by the rising pistons. 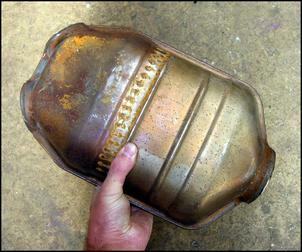 The gas then passes through a catalytic converter, perhaps a particulate trap or NOx adsorber, before then moving through one of more resonators and mufflers. If the exhaust flowed perfectly, there’d be no back-pressure. But we know that’s not the case, and so by measuring how high the pressures actually are, we can see how well the exhaust is flowing. Once again, the process is most accurate if it is undertaken when the car is being driven on the road. You can see that by measuring pressures in both the intake and exhaust, you can quickly and easily get a really accurate picture of what is occurring. 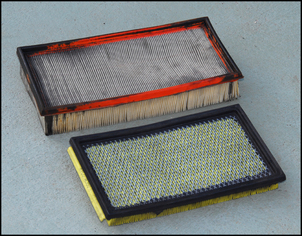 Straight away, you can know for sure whether it’s worthwhile changing the factory air-filter for an aftermarket unit, whether the intake snorkel needs an upgrade, or whether the tubing between (say) the air box and the turbo is restrictive. On the exhaust side, you can immediately see whether the exhaust system is restrictive – and also in what driving conditions it is most restrictive. Guesswork is minimised. So how do you make these measurements? On the intake side, restrictions will show up as pressure readings that are below atmospheric. That is, if there’s a restriction to flow, not all the air available from the atmosphere will ‘get through’ – resulting in a pressure drop. Measuring pressures below atmospheric can be done with a manometer or a Dwyer Magnehelic meter. The easiest way is to use the Dwyer Magnehelic gauge (other manufacturers also make similar gauges but they're not nearly as common). These gauges are incredibly sensitive to very small pressure variations and have superb, clear markings and a large size. These meters can be picked up at industrial junk places and on www.ebay.com for $10-$40. Pick a gauge that has a range of 0-20 or 0-30 inches of water, then if you find yourself using this gauge a lot, go for a second more sensitive gauge (eg 0-10 inches) so you can see what's happening in more detail. If you want an even cheaper approach, make your own manometer. This'll take you about 5 minutes and cost very little. You need: a plastic soft drink bottle (1.25 - 2 litres), a metre of so of dowel (any small bit of wood will do), sticky tape, 4 metres of small-bore flexible clear plastic tube. Attach wood to bottle, so when bottle is sitting upright, wood protrudes vertically above it. 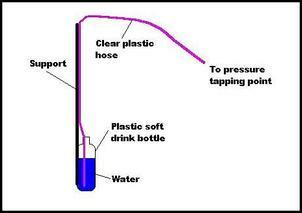 Attach plastic tube along length of wood, one end of the tube going to the bottom of the bottle. There will be lots left over at the top. Three-quarters fill bottle with water (put some food colouring in it if you want). Wherever the top surface of the water ends up, mark a line on the bottle. Every inch above that line (working your way up the stick) place another line. Write some numbers on the wood to mark off 5 inches, 10 inches etc, counting upwards from the surface of the water. The way this manometer works is similar to sucking water up a straw. Except in the case of car testing, the pressure drop in the intake does the sucking for you. In a turbo car, the maximum intake restriction is measured in front of the turbo. In a naturally aspirated car without a throttle butterfly, you can plumb the manometer or Magnehelic gauge to the intake manifold. 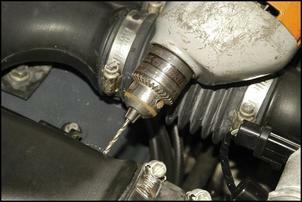 Connection to the intake system can normally be made by temporarily pulling a breather hose and using that point to make the connection. As the airflow rises and so the intake system starts to become restrictive, the measured pressure drop will increase. To put it simply, the water level will rise higher in the manometer, or the Magnehelic gauge will show a greater negative pressure (sometimes also called a ‘vacuum’). The first time I ever did this sort of testing was on a turbo Subaru Liberty RS. With an assistant in the car and a self-built water manometer placed vertically on the passenger side floor, I raced up a steep local hill in second gear, foot flat to the floor. At that stage I didn’t even know if the approach would work, let alone how high the water might go. My assistant called off the numbers as revs rose – 10 inches! ...15 inches! ...20 inches! ...25 inches! Her voice rose higher as she called the next figure – 30 inches! And then, knowing that the manometer height extended only to 31 inches, I lifted throttle. As soon as the airflow into the engine decreased, so did the measured pressure drop - and the height of the liquid in the manometer plummeted. Testing many different cars since has shown that a maximum total pressure drop of over 30 inches of water in the intake system indicates plenty of restriction. Another car with a poor intake was the 5-cylinder turbo Audi S4 I once owned. At full load it had a maximum intake system pressure drop of 32 inches of water. 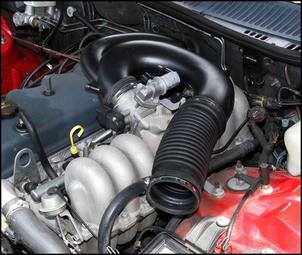 And, as you’d therefore expect, modification to the intake systems of both cars resulted in good performance gains. 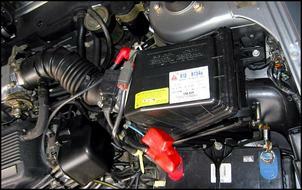 On the other hand, some cars have extremely good intake systems – eg ultra-efficient cars like petrol-electric hybrids. The NHW10 Prius has a measured total pressure drop before the throttle body of just 10 inches of water, while a Honda Insight has a measured maximum of just 4 inches of water – the best standard car I have ever measured. An EF Ford Falcon six cylinder has a max of 16 inches of water, a Holden JE Camira just 10 inches of water, a Toyota Crown Supercharger 20 inches of water, and a Peugeot 405 SRDT also 20 inches of water. From these figures you can see a total pressure drop of about 10 – 15 inches of water is a good achievable aim. In other words, if you measure a car and in standard form, it’s at 15 inches of water, there’s not going to be a lot of possible improvement to be easily made. On the other hand, if it’s at 25 or 30 inches, you can be certain that major improvements in flow will be possible. The next step is to work out exactly where in the intake the changes should be made. The same pressure measuring technique can be used to find which parts of the intake system are most restrictive – and which are not! I add the latter because invariably people think to change the filter. I have never seen a standard filter element cause any more than a tiny proportion of the total restriction in the intake of any standard car! 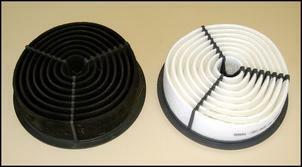 In fact, the pressure drop across the filter is usually in the range of just 1-2 inches of water. So if the system has a total pressure drop of (say) 15 inches of water, the filter typically causes only 10 per cent of the total intake restriction – that is, 90 per cent of the problem is elsewhere! But I’ve got ahead of myself – how do you find which parts of the system are most restrictive? The short answer is that you move the pressure sensing hose around, tapping into different points. In many cases, this will mean that you’ll need to drill small holes in intake ducts, the walls of the filter box and so on. 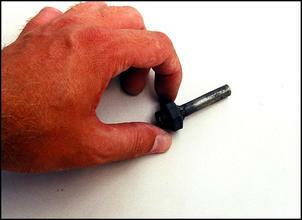 Screw a small fitting into the hole and then place the sensing tube over the top. The holes need only be tiny, and are easily later concealed with a wipe over with black silicone. Now all this might sound like a lot of work, but it can all be done in literally 30 minutes. This graph shows pressure drops measured in the Audi S4’s intake. You can see that as full-throttle revs rise, so does the flow restriction. 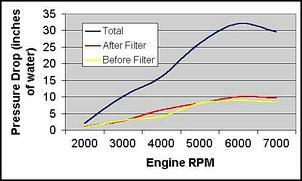 (And doesn’t the pressure drop versus rpm graph look like a power curve? It does because airflow is normally directly related to power.) You can also see that the pressure drop across the standard air filter remains very low at all times. 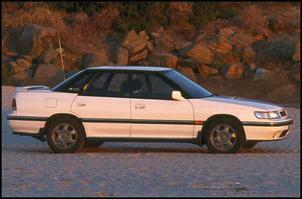 In this car, the greatest flow restriction was in the pre-airbox snorkel and front half of the airbox. In most modified cars, this list also shows the priority order in which changes are made. However, directly measuring the flow restrictions allows you to determine the best approach to take for any individual car. 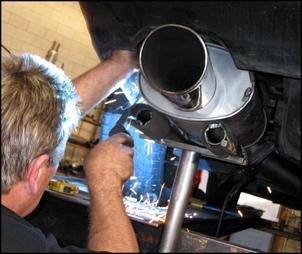 Much the same approach is taken when measuring the restrictiveness of the exhaust system. 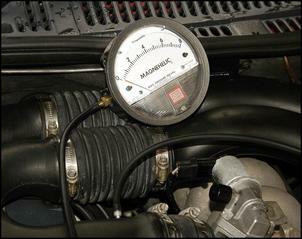 However, in this case, a normal positive pressure gauge can be used - eg an old turbo boost gauge. The tapping points into the system can be achieved in two different ways. 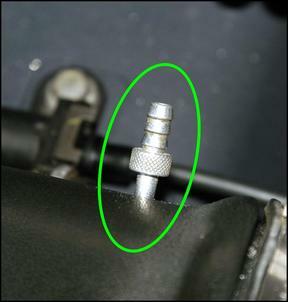 (1) If you want to measure the total backpressure, the oxy sensor can be temporarily removed and a replacement fitting screwed-in in its place. Run a hose to the fitting and measure the total backpressure at peak load. (If the testing is going to be extensive, you will want to make the first section off the fitting a metal pipe, allowing it to shed some heat before the hose – otherwise the hose can melt.) Because no gas actually travels inside the hose to the gauge, it won’t get hot and be damaged. (2) If you want to measure the contributions that the individual parts of the exhaust make to the total, you’ll need to drill holes at different points in the exhaust pipe. Unlike the intake system, where these holes are later easily filled, the exhaust will need to be welded to seal the holes. Therefore, you’ll be pretty well locked into having work done on the exhaust after doing this testing. (So that’s why it makes sense to start off with the total backpressure measurement first!) 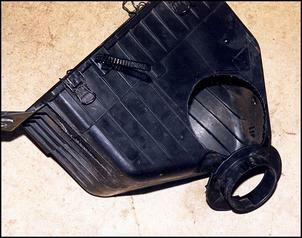 The holes can be temporarily sealed by the use of a hose clamp around the tube. Exhaust back-pressure should be measured after the turbo, or after the exhaust manifold / factory headers. So what sort of figures are you likely to see when backpressure testing exhausts? 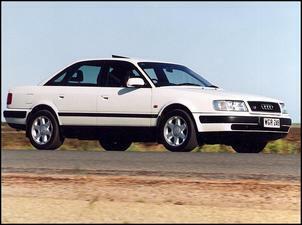 A standard Holden VL Turbo recorded 13.2 psi, a Subaru Impreza (fitted with a slightly more powerful Japanese-spec engine) had 8.8 psi and a Nissan 180SX had 9.3 psi max. A turbo 660cc Daihatsu Mira had 3.5 psi of back-pressure. 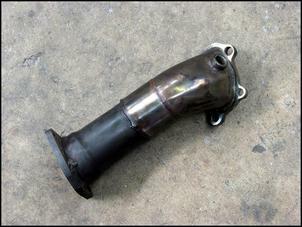 Looking at individual sections of the exhaust, on a slightly modified VL Commodore Turbo, the section of pipe off the turbo was causing 25 per cent of the total, the cat converter 19 per cent, the pipe between the cat and the rear muffler 26 per cent, and the aftermarket reverse flow rear muffler 30 per cent. Really major reductions in exhaust backpressure are possible on many cars - in the order of 75 per cent. 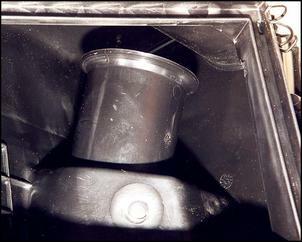 In most cases, the cat converter is the most restrictive element, followed by the main muffler. Unless bends are very tight in angle (eg 180 degrees), press-bending does not normally cause much measureable restriction. Going up one size of tube and using press-bends is usually more cost-effective than buying mandrel bends. Don’t forget that if your car is not very powerful, fantastic bargains can be had by fitting the components from discarded standard exhaust systems from more powerful cars. At absolute minimum, before you spend a dollar on modifying the intake system, measure its total pressure drop at full load. That will immediately show you the potential for improvement – whether there’s a lot or little. If there’s a lot, you can then do some more measurements to find out which parts of the system are most restrictive. Again, at absolute minimum, measure the total exhaust backpressure before spending anything on modifying it. Measuring pressures through intake and exhaust systems is simple, cheap and extraordinarily effective. It adds a huge flowbench to your tool kit and simultaneously takes into account all the real-world conditions that occur on the road.